Getting married means receiving a plethora of gifts from family and friends. Some of them you’ll love, and others you won’t— but either way, you need to send a thank you card to the givers for the items. Every time you receive a gift, at home or at a shower, write down who gave it and what the item was, along with a few details. 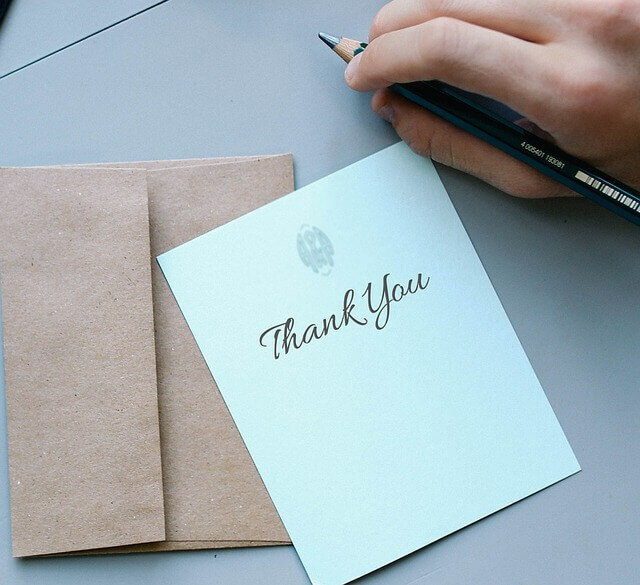 You can keep a paper list, a note on your phone, or a spreadsheet on your computer to make life easier when you get around to writing the thank-you notes. When it comes time to actually write the notes, you may feel your mind going blank. Follow these steps to write meaningful thank-you notes for every wedding gift you receive! Writing a thank-you note for a gift you genuinely love is fairly easy. Mention the item specifically, and explain what you like about it. You can also include details of how you plan to use it, or how you’ve already enjoyed it. Express your thanks for the time and investment the givers showed in selecting the present. If your wedding has already occurred, thank them for coming (if they attended) or for sharing the joy of the union with you via the gift. If your wedding is happening soon, tell the givers how excited you are to share the special day with them in the near future. If you are planning to return the gift, or if you’ve already done so, follow the same rules you would for a gift you love— except don’t tell the givers how you’re planning to use the gift. Emphasize their thoughtfulness and sweetness. Tell them what you liked about the item, without going overboard into lavish praise. You don’t need to tell the givers that you’re returning the present. Limit the note to your thanks and a line or two of detail about the item, and then end the note with an expression of your appreciation for their friendship or their family relationship to you. Perhaps you received a wedding gift that you didn’t really like, but you can’t return it, for one reason or another. How do you write a thank-you note for that item? First of all, keep it simple. Avoid prolific praise for the item, such as “it was so incredibly beautiful” or “this is something I always wanted.” That type of over-the-top praise may ring false to the givers, or they may take it seriously and buy you a similar present in the future, resulting in more awkwardness. Instead, mention how thoughtful the givers were in selecting the item. Mention their generosity, their kindness, or the time it must have taken them to choose the gift for you. If there’s any aspect of the present that you did appreciate, mention that. Even if you truly hate the gift and it shows a complete lack of care or understanding on the givers’ part, resist the temptation to be brutally honest or rude about it. Keep the note short, simple, and classy, and move on. Remember that simplicity, tactful honesty, and gratitude are key! If you follow these rules, you’ll be able to create meaningful, sweet notes for everyone who gave you a wedding present. If you don’t have a wedding location yet, call today to schedule a tour of our beautiful wedding venue at Nanina’s in the Park.